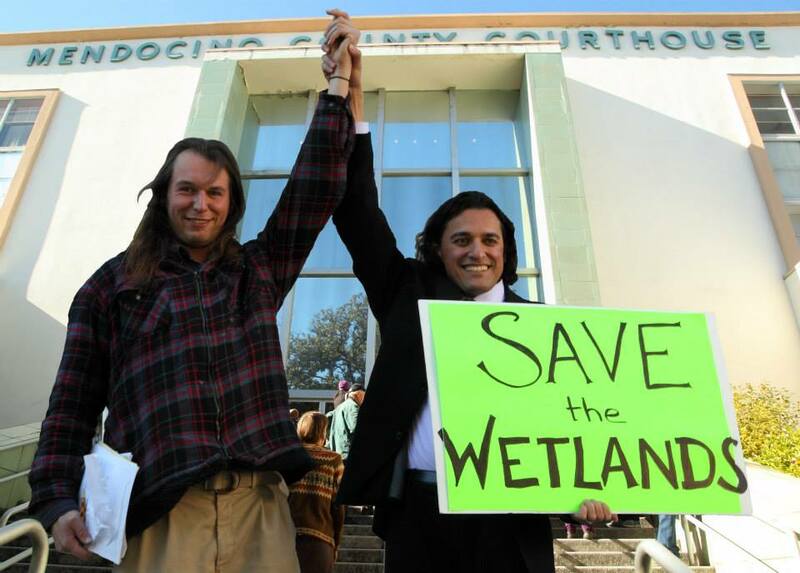 Two court reports: Richardson Grove redwoods last week; Willits Bypass Protester in Court this week Richardson Grove Update: WIN in Appeals Court! After a hearing in Mendocino County Court Jan. 23, a settlement was reached that cancelled the upcoming trial, scheduled for Jan. 28. *15 of the 17 misdemeanors were dropped, retaining two charges of trespass, which drop to infractions after a probation period of 24 months. *Two years probation, during which entry of judgment is deferred –i.e., sentencing remains open during that time. *In addition, a previous violation of a stay-away order was dropped, and the stay-away order was modified so that Parrish can participate in lawful public gatherings at or near the Bypass site. Over 50 supporters were in attendance and Parrish and his attorney Omar Figueroa held a victory press conference. A restitution hearing will take place April 25, unless a stipulation is reached before then. Caltrans’ Willits Bypass activists will converge on the January 30 meeting of the North Coast Water Quality Control Board (NCWQCB), taking place in Santa Rosa (5550 Skylane Blvd.) on Thursday. At issue is a water supply crisis faced by the town of Willits and the massive water use by Caltrans for their highway project, which broke ground in February of 2013. Caltrans has already pulled approximately eight million gallons, half of that from local wells, in an area with an already compromised water table. Their mitigation plan is in shambles. Gov. Jerry Brown who, in his “State of the State” address on Jan. 22, called for “serious groundwater management”, citing the need for “wetlands and watershed restoration,” due to the drought disaster that California is facing. Those in favor of halting or at least seriously down-sizing the Bypass project point out that critical wetlands are being drained and buried for this highway project that is an unnecessary multi-million dollar boondoggle. The message is clear. It is unconscionable for Caltrans to destroy nearly 90 acres of fragile wetlands and use millions of gallons of water for dust control, soil compaction, concrete mixing and other industrial uses to build a freeway that is not needed. If you can go to the Water Board meeting in Santa Rosa, the public comment time is 8:30 a.m. There will be hand-outs for those wanting to testify. Call, email or write Jerry Brown and tell him to give truth to his words and stop the destruction of wetlands in Willits for unnecessary highway construction! You can email him from the Governor’s website at http://govnews.ca.gov/gov39mail/mail.php.